A premier oyster bar, Shuck serves only the freshest oysters flown into Orange County daily. With 48 types making the menu during each seasonal period, guests will enjoy the briny unique flavor of a variety of these shelled delicacies. 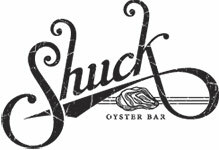 Shuck’s knowledgeable staff is available to assist with ordering oysters or non-oyster items.